WESTMINSTER, Md., Dec. 21, 2010 -- Thanks to a $5,000 grant from Northrop Grumman Corporation (NYSE:NOC), the nationally-recognized VEX Robotics program will be coming soon to four Carroll County Public School System high schools. The VEX Robotics program is a national math and science-focused effort dedicated to providing engaging and fun student educational experiences that foster an interest in science, engineering and problem solving. The Northrop Grumman grant will provide students with the opportunity to learn about robotics, while participating in various VEX Robotics competitions. "Partnerships with companies like Northrop Grumman who provide funding and mentors are the key to energizing and sustaining interest in engineering and science," said Stephen Guthrie, superintendent of Carroll County Public Schools. Bryan Shumaker, STEM (Science, Technology, Engineering and Math) Coordinator for Carroll County, said, "We had a definitive need. Four schools wanted to start robotics clubs but they didn't have equipment. The students and teachers were interested but they needed funding." 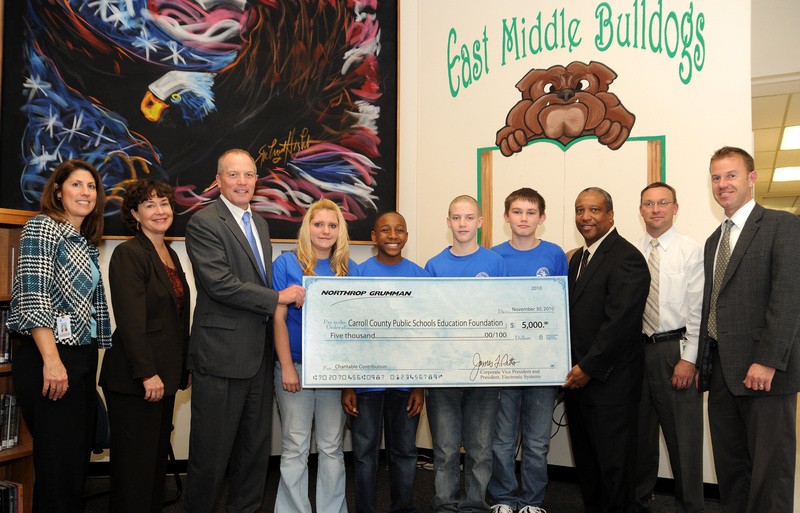 Northrop Grumman's support of STEM education is not new to the Carroll County community. "Our employees have supported STEM in Carroll County and throughout the central Maryland region for many years," said Ted Imes, director of Corporate Citizenship at Northrop Grumman's Electronic Systems sector, which is headquartered in Linthicum, with other company facilities in Sykesville, Elkridge and Annapolis, Md. "Programs have included our DiscoverE Engineering program, where employees go into the classrooms to teach students about engineering, sponsorship of a week-long Engineering Camp for middle school students at Carroll Community College and other activities designed to support STEM." Earlier this year, Northrop Grumman sponsored four students and a teacher from East Middle School in Westminster to attend Space Camp in Huntsville, Ala. "After this experience (Space Camp), I want to be an engineer," said Cai Davis, a student who participated in the event.